Richard Attenborough is not typically a director that one associates with screen horror, his name usually calling to mind such sweeping epics as Gandhi, Cry Freedom, or Chaplin. However, in 1978, Attenborough broke tradition and directed a small, intimate horror film: Magic. 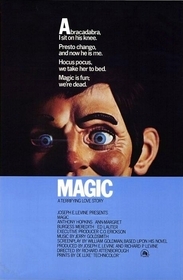 Based on a novel by William Goldman (of The Princess Bride and Marathon Man fame), Magic is indeed a frightening film. It is not, however, the shocks that make it memorable. What makes this film special is the thought that has been put into it and the conviction of its performances. Boasting a sadness and a nasty sense of horror, Magic avoids the campyness that is usually associated with movies about living dolls. Instead, Magic takes the serious approach, using Fats, the sentient ventroquist dummy, as a means of exploring the effects of a split personality, and the damage it can cause when left untreated. The result is a quiet horror film that is as potent and terrifying as Halloween or The Texas Chain Saw Massacre. Corky Withers (Anthony Hopkins) is a struggling magician in the Catskills Mountains with almost no charisma. In his lonely home with his dying mentor (E.J. André), Corky believes that he will never succeed in show business and resigns himself to despair. Fast forward one year, however, and Corky, with the help of a ventriloquist's dummy named Fats, is a rookie sensation. Shortly thereafter, his agent, Ben Greene (Burgess Meredith), secures a deal with NBC for a TV pilot. Unfortunately, Corky balks when he is told that he must take, per "network policy," a medical exam. Corky, who we have already seen is more than a bit unbalanced, flees to the home of his high school crush Peggy Ann Snow (Ann-Margret), who is not so happily married to her husband Duke (Ed Lauter). Once there, Fats’ true nature becomes violently apparent. The virtuoso camera skill of Richard Attenborough helps to make Magic outstanding, Attenborough proving himself to be a master of suspense. In one outstanding scene, Corky is trying to read Peggy’s mind through playing cards. At first, it almost seems like a cute little game, and it is shot from a relatively high angle adding levity to the situation. However, when Corky fails in his attempt to discover Peggy’s card, he becomes very aggressive. The camera begins to film things from below, accenting both Corky’s anger and Peggy’s fear. Attenborough then mixes in some intense close-ups of Corky’s and Peggy’s eyes, making the scene intensely personal. When Corky finally divines Peggy’s card, the camera backs off, and returns to its elevated position. Using nothing but camera work, Attenborough poignantly illustrates that Corky is both very sweet and very dangerous, all the while leaving us on the edge of our seats. Attenborough's gift for characterization and tension in direction is further exemplified later in the film. Ben challenges Corky to make Fats “shut up for five minutes.” As soon as Ben says this, it is obvious from the look on Corky’s face that he won’t be able to do it, but he sets Fats next to him and begins the challenge anyway. Attenborough begins changing the camera focus from Corky to Ben, switching back and forth between the two. The one exception a single, slow shot that rotates around Corky and Fats until the are both almost in profile with each other, accentuating that they are two halves of one person. When Corky finally acknowledges he can’t do it, he grabs Fats, who begins talking fast and loud. Attenborough tops this off with a tight close-up of Fats screaming “Here’s FATS!” It is a marvelous scene, and a great example of how Attenborough can squeeze tons of tension from very few elements. Attenborough’s camera skills are complemented by a superb cast. While the direction may highlight and accentuate the characterizations that drive Magic, it is the acting that really brings these characters to life. Ann-Margret does an excellent job of portraying Peggy. This is a role that could easily have been nothing more than a token “love interest,” but Ann-Margret never performs her as such. In Ann-Margret's hands, Peggy becomes a quirky, independent woman that has needs apart from the other characters in the film. She plays Peggy with a fun loving zest that contrasts sharply with both the intense Corky and her laconic husband, Duke. Even when faced with trite dialog (especially the line “If I’m a prize, then you’re the winner,”), Ann-Margaret still manages to hold her own, making Peggy a worthy counterpart to the unbalanced Corky. This excellent performance is matched by the one and only Burgess Meredith, who is magnificent as Corky’s manager, Ben Greene. Speaking in a slick, silky voice, one can almost hear all of his years of experience managing unstable stars like Corky. Meredith plays Ben as someone who has seen it all. Even though he is always full of wise one-liners and wisecracks, he portrays a real concern for Corky, becoming Corky’s only anchor to reality. It is because of Meredith's acting that, when Corky murders him later in the film, we can really understand how Corky loses any shred of hope he might have had. Not only is Ben a character, because of the outstanding performance, he is also a very potent plot device. Meredith is indispensable to this film, despite being only a supporting character.. Neither of them, however, can hold a candle to the dual performance of Anthony Hopkins, who plays both Corky and Fats. He performs Corky as a shy and intense man who has been defeated by life. A deeply troubled person, Corky has found a way to manage some of his problems through the use of Fats, a foul-mouthed outlet for his own inherent violence. Hopkins usually talks softly as Corky, except when he is pushed, and often has a nervous laugh that gives the impression of covering for hidden fear. In one scene, when Fats is mentally tormenting him, Hopkins spins around the room, crawls across the floor, and finally screams in pain against a mirror. A lesser actor might have made this scene seem ridiculous or unintentionally funny, but in Hopkins hands, its heart-wrenching cry of pain makes us understand how such an otherwise gentle person could take to murder. Hopkins is equally good when performing Fats. Prior to filming, he studied ventriloquism with ventriloquist Dennis Alwood, and the research shows. Hopkins creates a truly frightening character in Fats, despite him not being a physical person. Fats is full of obscene, Borscht-Belt humor, but he has a viciousness that is downright chilling. Hopkins performs the voice of Fats in his head, and also does Fats’ ventriloquism. His voice sounds childish at first, but it soon transforms into something sadistic and dangerous. The Fats dummy only adds to Hopkins performance. It has the appearance of a vicious Anthony Hopkins, with an unsettling smile always on its face. Overall, Anthony Hopkins makes this film both a superior horror film and tragic character study, all by means of one wonderful performance. The only weakness of the film (and it is a minor one) is that about a third of the way through it jumps plot lines. From the beginning, we had been following Corky’s rise to fame and how the possibility of being on television was causing his already shaky personality to crack. He then runs away to the country and just happens to run into his high school love whose own marriage just happens to be collapsing. Stories that have to hinge upon some very improbable coincidences always seem weak, or at best rushed, and this is true Magic Rather than have Corky early on express a longing for his old flame, the script cuts corners by having him unexpectedly find her, which then forces us to sit through a great deal of exposition explaining who Peggy is and why Corky loves her. However, it's only a small problem and does not significantly harm the story. Magic is one of the unsung gems of 1970s horror cinema. 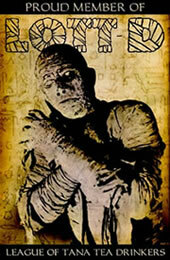 It boasts a potent if not original story, superb direction, and a cast rarely equaled by its contemporaries. The evil smile and malevolent voice of Fats and the pathetic story of Corky are frightening and not easily forgotten. Submitted by Anonymous (not verified) on Wed, 2010-04-28 14:40.
i collect 70s/80s horror movies and i ordered magic because it looked so interesting. i just got done watching it and i have to say it is without a doubt, now one of my favorites! its kind of a cross between the dummy twilite zone episode and torist trap. Submitted by Zooi (not verified) on Thu, 2012-06-07 16:36. Can't disagree with this review. Hopkins early talent shining through.